Get ready to experience creepy, crawly, eerie, ghoulish and frightening Halloween fun in Minneapolis! You can get your fix of all things Halloween at our haunted houses, pumpkin patches and several miles of corn mazes. And don't forget about the Zombies. There are lots and lots of Zombies. While you're here, be sure to check out the Halloween Capital of the World, Anoka, MN! Enjoy and explore the 200+ acres, producing Minnesota grown of apples and huge pumpkins. Venture into the 15-acre corn maze or take a hayride into the orchard for apple picking! Don't miss their apple festival September 29th & 30th, Oct 6th & 7th, and 13th & 14th, 2018! 8 scary attractions including Crop Spawn, Phobia House, Ludicrous Labyrinth, Zombie Apocalypse CDC, Circus Asylum, and more. Learn the history of Clifton Avenue and possibly meet the ghost of one of the Carpenter family's chambermaids, Gertrude. Walk through the main mansion, grounds, and carriage house, all in the most comfortable way possible: in the dark, of course. Every tour at 300 Clifton includes loads of history on the house and neighborhood, but only in the Candlelight Tour do you get to tour the creepy parts of the house and hear the stories of the ghosts of 300 Clifton, and maybe even experience contact with the other side! The acclaimed Jack-O-Lantern Spectacular will make its debut at the Minnesota Zoo this October 2018! An enchanted forest, nestled in the heart of the Zoo, plays host to this strolling exhibit. The trail features over 5,000 illuminated pumpkins of all different sizes, shapes and faces creatively carved and displayed from ground to tree-top. A variety of musical vignettes and fog make the perfect back drop for a special date night or family-friendly, fall outing! Tickets range from $12-$18. Prepare yourself for an immersive theater experience at the Haunted Basement. You may get very messy, you may have to crawl, and you may find yourself in a confined space with something horrible. So, maybe leave your nice clothes at home. 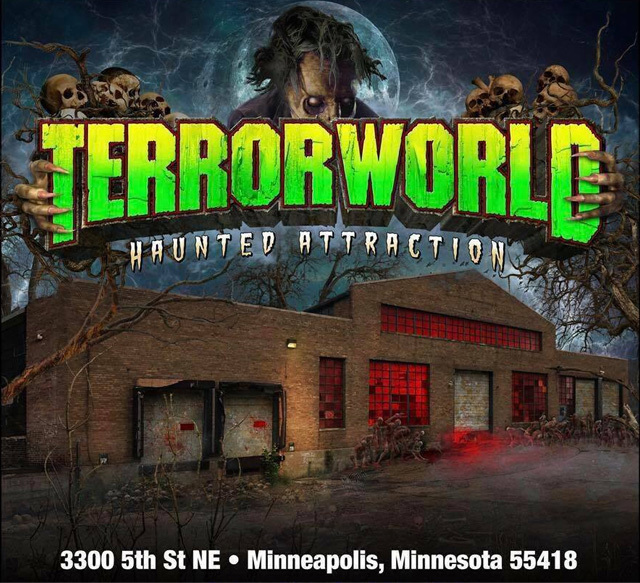 Now nestled in Northeast Minneapolis, this haunted house is in a huge warehouse filled with the vilest of nightmares. Evil lurks behind every corner for 17 days straight. Heart problems, pregnant women, or people who suffer from seizures are not recommended to enter. No kids under 14. If you can’t handle evil and fear directly in your face, then this may not be for you. A live DJ a pro BMX show is featured every night with professional X Games riders entertaining the line. 11 terrifying days of theater, dance, music, and film at the Southern Theater in Minneapolis. Don't be lulled by the splendor of the gardens or the fine furnishings. Rumors abound of dark events of the past which are linked to other-worldly phenomena of today. Is 300 Clifton haunted? For the first time ever, an experienced paranormal society will attempt to answer this question, and YOU can be special guests in the investigation. This 18+ party is sure to get you out of the house on a Wednesday! Dress up and attend the best Halloween Party in town, presented by City Pages. Get your tickets today!